Pain from old injuries prevented Richard Hughes from working to his full potential in the gym, and left him with a nasty Advil habit. Meanwhile, his weight crept up so high that he sometimes feared he was one step away from a heart attack. 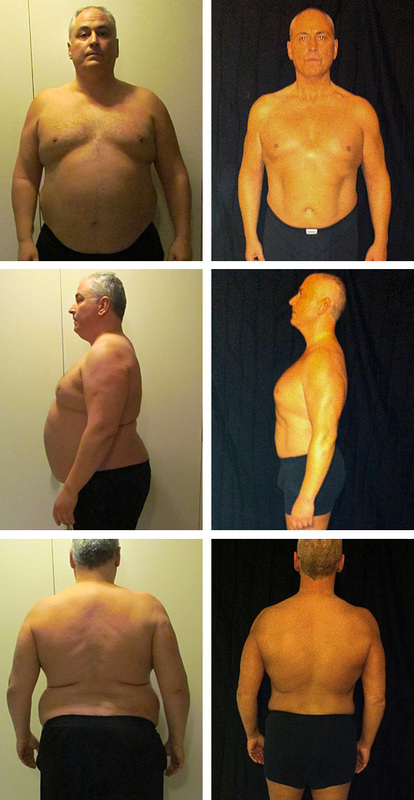 Precision Nutrition Coaching let him live pain-free without the drugs, while helping him lose more than 100 pounds. These days, Richard’s heart is happy, and instead of serving as a warning of what not to do, he’s a living, moving inspiration to others. Lost 103 lbs and 20% body fat! There’s a warmth, openness, and lively enthusiasm to Richard Hughes that you just can’t miss. Talk to this man for five minutes and you’ll find yourself smiling. But I get the sense that it hasn’t always been this way. After all, Richard used to live with chronic pain. And people in pain don’t usually bubble over with positive energy. The thing about chronic low-level pain is that you can grow used to it. It’s like gradually losing your vision or your hearing. You forget what things were like for you, before. And you find ways to compensate. You cope. Which is exactly what Richard did. By shirking at the gym, swallowing a lot of Advil, working so hard that he’d forget to stop for lunch, and gorging on pizza and beer when he got home, he managed to ignore his constant discomfort. In short, he numbed out. In a way, Richard’s choices made sense. They allowed him to function. Meanwhile, his weight kept creeping higher and higher. And his energy kept leeching away from him. The scale registered more than 300 pounds before Richard recognized that he had gone way past chunky to downright obese. As a massage therapist, that meant he wasn’t exactly a model of health for his clients. What’s more, it was becoming more and more difficult for him to perform his work well. Some days, he could barely make it from his car in the parking lot to the therapy room. The sad reality? Richard couldn’t support his own body weight. At times, he feared he was one step away from a heart attack. At over 300 lbs, Richard struggled each day and put himself at risk for a heart attack. Something had to change. And he knew it. It was the sight of Jeanne Douthit that flipped the switch. Jeanne, a Precision Nutrition Coaching finalist, and later, a mentor in the program, had been employed at the gym where Richard worked for a number of years. He knew about her own struggles with weight. He also knew that she’d achieved considerable success on her own, even before joining the coaching program. In fact, over the years, she’d managed to drop about a hundred pounds, and had earned her credentials as a personal trainer. In other words, this woman was determined, hard-working, and knowledgeable. So why would she need a coaching program?, Richard wondered. Jeanne’s weight had shot back up after the birth of her third child, who had some special needs. In seeking care for him, she’d understandably lost focus on her personal fitness. She joined Precision Nutrition Coaching as a way to address that. After a year in the program, she’d lost the weight she wanted to lose. But Richard would have expected that. It was the other changes that surprised him. This time, Jeanne wasn’t just a smaller version of her old self. This time, her body was a different shape. She’d lost her saddlebags. Gained muscle definition everywhere. What’s more, in talking with her, Richard could tell that the changes in Jeanne’s body reflected changes in her mind and soul. Something profound had happened to her. She wasn’t going to lose her focus again. If she could do it, maybe he could do it. Richard’s doctor helped him set a goal weight of 188 pounds. The number sounded so far away from 318, where he was starting. “I couldn’t fathom losing that much,” he confesses. Then there was the gym. At the gym, Richard felt so shaky. It hadn’t always been that way. A former landscaper, Richard had once loved exercise. But it was during his landscaping career that he’d sustained the injuries that prompted him to switch professions. And although he believed he had healed, in fact, those old imbalances had never been properly addressed. Besides, it’s one thing to enjoy exercise when you are young and relatively fit. It’s another when you are 49 years old and vastly overweight. Richard had cared for his mother when she fell ill with cancer. And when she’d died, he’d cared for his dad. In other words, for a big chunk of his life, this man had been serving as a support for others. He was solid. Caring. Capable. And he’d come to base his identity on that. Now, he was the one who needed support. Struggling with simple movements in his workouts, feeling lost and embarrassed. Worried about falling and hurting himself. Worried about failure. He didn’t like the feeling. It didn’t occur to Richard at first to ask for help. Asking for help would be like admitting he wasn’t tough enough. If I can’t do it the way I should do it, I’m a loser, he told himself. In fact, in the beginning, his wife was more than a little skeptical. Luckily, Richard’s 26-year-old daughter had moved home. She loves creating gourmet meals. So she rolled up her sleeves and got to work to help Richard meet his nutrition habits. She also helped Richard with the lessons. But he needed a lot of undistracted time to get through them. And sometimes it was a struggle. So his daughter jumped in to read along with him and help explain if he had questions. Little by little, day by day, Precision Nutrition Coaching was becoming a family affair. And between the healthier meals that his daughter was preparing, Richard’s hard work on the lessons, and his renewed efforts in the gym, he started to shed his excess weight. He was also discovering the anti-inflammatory properties of fish oil. His regular dosing of Advil had come to seem perfectly normal. “It’s like I forgot that people don’t usually take that stuff all the time,” he says. Even better, he was regaining trust in himself. All of a sudden, this time, he was doing it. Sweating like crazy, but doing it. And more than that, he felt solid. Stronger. Capable of self-support. Richard finding his strength in the gym. Then he injured himself again. Twice, in fluke accidents at home, he fell, twisting his knee and landing on his bad shoulder. His knee was wonky. And there were two massive tears in his rotator cuff area. At first, Richard was devastated. Would his progress be completely derailed? Doctors told him he’d need an $800 knee brace and surgery for the shoulder. He bought the brace, but he couldn’t face the prospect of an operation. Not now. Taking a year off work was not an option; his family needed the income. Besides, he wanted to finish the program. In retrospect, he wonders if those injuries might have been a blessing. Because it’s the injuries that finally prompted him to reach out to his coach, Jason Bonn, who promptly suggested a few modifications. Those mantras appear in bold print at that start of each Precision Nutrition Coaching workout. This was his biggest challenge. Coach Jay talked Richard through his fears. He reminded Richard of how far he’d already come and the changes he’d already made. “You aren’t giving up on yourself any more,” Jay said. So instead of quitting, as he was tempted to do, Richard kept going. Instead of blaming himself, he took the support that his coach and his family were so generously offering. And the pounds kept coming off. By the end of the program, Richard had almost reached that formerly impossible goal weight — and he’d regained a substantial range of motion in his injured shoulder. In fact, his shoulder was so improved that his doctor told him he could do without the surgery now. “You’ve learned to compensate,” he said. And this time, Richard was compensating in a healthy, balanced way, instead of by numbing himself out. Sometimes, it’s the little things that make the biggest difference. Now that he’s lost so much weight, Richard’s been fielding a lot of compliments. His daughter took him shopping for new clothes and he’s so thrilled about how he looks in the new, trendier styles that he likes to get dressed up even if he’s not going anywhere. It’s become a bit of a family joke. The teasing is all in good fun. Because now, his wife has lost her skepticism about the program. Having dropped around 70 pounds just by following along with some of the nutritional habits while Richard was a participant, she has since joined Precision Nutrition Coaching herself. You stretch yourself. Grow. Discover your inner resources. The man who couldn’t support his own weight standing up is now pulling his own weight. And aiming higher. Richard’s reaching high, after his next big goal. Want to read more great stories like Richard’s? Then come meet a few other men, women, and couples who lost weight, started eating better, and took control of their health.